Olarm is a South African based technology company specialising in the manufacturing of products that make use of the Internet of Things. The Internet of Things (IoT) is changing simple homes into smart homes, enabling everything from your locks or your watering system to your lights to be controlled from your smartphone. Making use of this technology, Olarm enables their clients’ mobile phones to speak to their house or office’s alarm systems from wherever they are. Essentially it makes the alarm system ‘smart’ by enabling it to connect to and speak to a mobile phone. “Our view was that alarm systems are being left in the ‘dark ages’ while everything is going digital,” says James Robertson, one of the founders of Olarm. In doing their research Olarm found that while security is a priority for South Africans, home security is often seen as a grudge purchase and convincing people to replace their alarm system with something more up-to-date is difficult to say the least. Most alarm systems fulfil the basics of home security in the form of armed sensors that go off when movement is detected. But there are a number of shortcomings to these systems and false alarms play a big role in the effectiveness of the technology. A major shortcoming is that in most cases when an alarm goes off the armed response team are unable to identify which zone the alert was triggered. This is why Rob Hensliwood and James Robertson decided to developed Olarm’s digital approach. Once Olarm is installed it gathers all of the alarm system’s sensor data in real time and feeds it to the server. This means that every single ‘zone event’ is pushed through by the device instantly and can be monitored in real time. 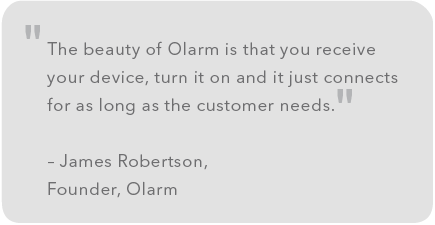 By digitising the data Olarm makes the alarm system smarter and gives the owner complete insight into their alarm. This enables owners to know at a glance whether everything is in order, without having to wait for armed response to peer over the wall and check. This upgrade effectively brings any home security system out of the ‘dark ages’ and into the digital age. With Olarm’s technology one is able to manage any alarm system from any iPhone or Android device. There is no need to replace the existing alarm system as the Olarm technology is compatible with most systems. The easy-to-install, exciting new technology enables users to view a history of all events and activities logged by the alarm system as well as receive alerts through push notifications, such as loss of power. Made in South Africa, the system is also protected from load shedding. 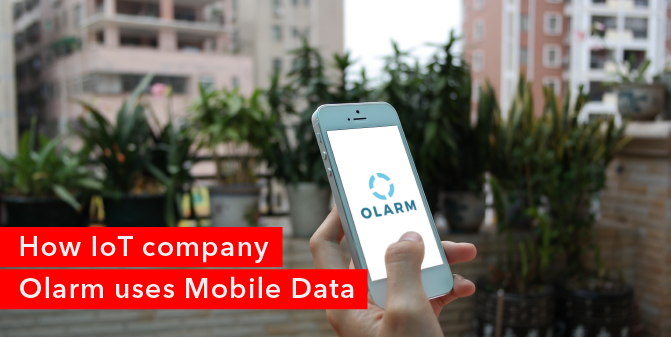 Founded in early 2015, Olarm’s offering is unique as they not only provide the IoT app software but they also supply the SIM card with the device, saving the customer time and money as they no longer need to worry about purchasing a SIM card or loading data. As the supplying of the devices’ SIM cards is an essential part of the business offering, James and Rob are soon expecting to be managing thousands of SIM cards and their data usage on a daily basis. While the data requirement for the device is minimal, “the sheer scale of alarm systems connected throughout the country was seriously daunting,” says James.